When a wind farm is in operation phase there is still something that can be done to improve its productivity: the installation of extensions on the rotor blades of the wind turbines – RBE – Rotor Blade Extension. Energiekontor analyzed the production on its own wind farms and realized that some of them didn’t have the expected production. Thus, in 2009, fk-wind, from the Hochschule Bremerhaven, designed a prototype of a blade extension that consists of an additional blade tip segment, fixed at the blade tip of the rotor. That system was certified by DEWI / OCC in 2012. Since November 2009, Energiekontor is operating an extension prototype on a Bonus type 54 turbine, in the Debstedt wind farm, north of Bremerhaven. During the observation period, a 5-6% Annual Energy Production (AEP) increase output could be observed. In 2011, Energiekontor requested a new prototype design to fk-wind, for a turbine Bonus type 62. 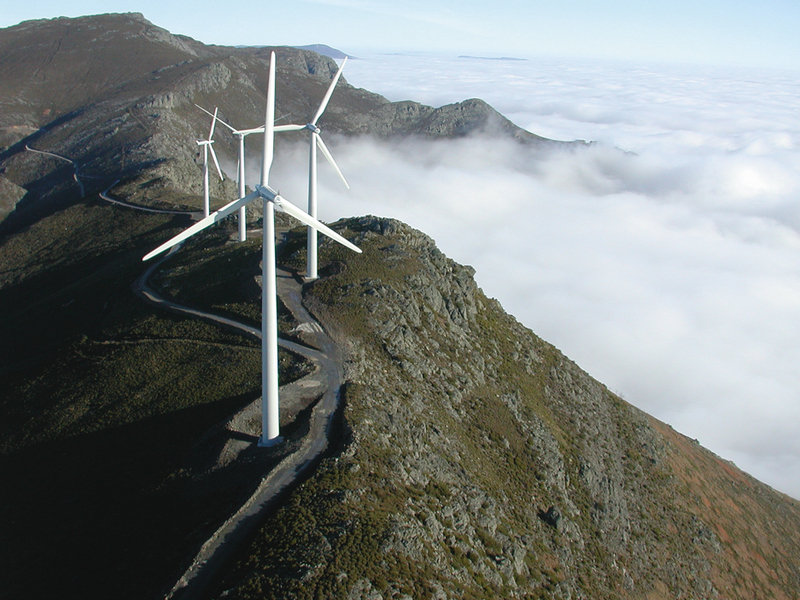 That prototype was installed in 2014, at wind farm Penedo Ruivo in Portugal. An output of 6-7% was observed. RBE – Rotor Blade Extension applies to wind farms that aren’t producing what was expected on project phase. On that phase there was an expectation for a certain annual average wind speed which didn’t occur, however the wind turbine class was chosen according the initial expectation. It means the WTG (Wind Turbine Generator) has a load reserve that has not been used and can be used by installing RBE. It has been proven that RBE extra loads on the machine are all within the parameters defined for its classification according IEC, so the lifetime of the modified turbines is not affected. Regarding the main purpose of these prototypes, Energiekontor had a confirmed result of an improvement of 5-6% AEP, for the modified wind turbine type Bonus 54 and an improvement of 6-7% for the modified wind turbine type Bonus 62. For similar turbines and similar sites the method described will be a solution for the improvement of the wind farms. Earlier mistakes in planning and energy prediction can be corrected. More turbines types, in similar wind farms, will be investigated and equipped with an extension in the future. Furthermore the hysteresis of switching between the two modes of operation will be optimized. This can additionally reduce fatigue loads by minimizing the number of switching events. Find more about the advantages of Rotor Blade Extension installation in wind farms already in operation at: www.rotorbladeextension.com/advantages-blade-extension. How to buy Rotor Blade Extension to improve wind turbine efficiency?